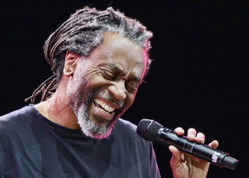 Last Friday I returned home from a week of improvisational singing, led by Bobby McFerrin and his hand-picked staff. What an amazing experience! We sang in large groups with structured parts (improvised on the spot), and we sang in smaller groups with more free-form improvisations. We learned dozens of concepts and techniques for shaping and guiding spontaneous singing. But mostly, we just sang together. I feel (re-)awakened to the vastness and beauty of music, and renewed passion for singing. It was like experiencing singing in a new way: the freedom and immediacy of going from mind to sound, without fingers, wood and strings to negotiate. It was also a humbling week - a return to musical fundamentals, listening and bringing music out of myself, over and over, at new levels. I met many fascinating and warm-hearted folks from every corner of the globe. The emotional and spiritual power of 100+ people raising voices together in harmony, day after day, hit me hard. It brought me closer to joy and pain that I'd been keeping at bay, at arm's length. It reminded me what I cerebral guy I am, and how there are times when it's okay to give oneself over to the moment. The week reached into dusty and dark corners of my soul and illuminated new possibilities. I don't yet know how this experience will reverberate in the rest of my life, and in my music-making. More adventures ahead. 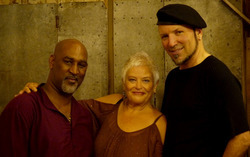 WeBe3 is an improv vocal trio with Rhiannon, David Worm, and Joey Blake. They're an acoustic duo with David Worm and Mark Vickness.